The Israeli Airforce carried out, on Saturday evening, several airstrikes targeting Gaza, killing two children and wounding at least twenty-five Palestinians in Gaza city, when the missiles struck a building next to a public green park, filled with people. 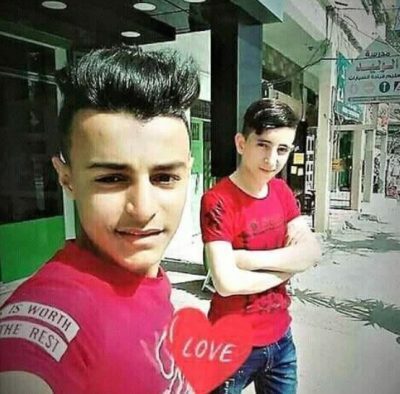 The Health Ministry in Gaza said the Israeli missiles killed Amir an-Nimra, 15, and his friend Luay Kahil, 16, in addition to causing injuries to at least 25 other Palestinians. It added that the Israeli missiles also targeted ambulances, the Central Medical Emergency building, and several mobile clinics. The targeted public square, known as al-Kateeba, is near al-Azhar and the Islamic Universities, and is surrounded by several government ministries and facilities. It is also used by Palestinian factions when they celebrate certain events, such as the anniversaries of their establishment. Being one of the few green and public squares in Gaza, it has a public park, slides and swings for the children, and is usually overcrowded with people, especially in the evenings after dark, due to the heat. According to eyewitnesses, Israel F-16 warplanes fired at least five missiles into the park and a building next to the park, in addition to firing missiles into another area, west of Gaza city, and Palestinian lands in al-Jala’ area, in northern Gaza. Besides killing the two children, and wounding at least 25 other Palestinians, the Israeli missiles destroyed one ambulance, damaged nine other ambulances, partially damaged three trucks used for transporting medicine and medical supplies, severely damaged a number of administrative offices for medical emergency and transportation, in addition to causing damage to two civilian transporting vehicles. Late on Saturday, Reuters news agency reported that Egyptian officials had negotiated a ceasefire between Palestinian fighting groups and Israeli authorities, but Israeli officials did not corroborate this claim. According to Reuters, an unnamed Palestinian official told them, “Egyptian and international efforts succeeded in ending the current round of escalation”. Israeli media claimed that 4 Israelis in Sderot were injured when the sound from a Palestinian shell near their house shattered their fish tank, and the glass from the fish tank cut them. The Palestinian shells have been described as little more than fireworks, which are fired across the border with Israel and usually hit farmland. Occasionally they hit a building, and leave holes of two to three inches, but seldom do they cause damage beyond that. 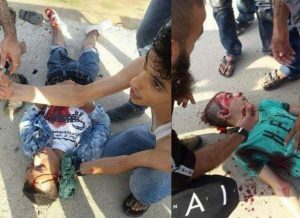 25 Palestinians were wounded by the Israeli bombing, many of them critically wounded with severe injuries from the missiles dropped by F16 jets on the civilian population. A number of those injured are children and women who were out walking in the park when the bombs were dropped, according to Ashraf al-Qedra of the Palestinian Ministry of Health. The latest escalation in violence by Israeli forces follows a three month period in which Israeli forces repeatedly attacked non-violent protests with live ammunition, massacring 137 Palestinians, and wounding more than 15,000 others, since the outbreak of the protests, on March 30th 2018. On Monday July 9th, as the tactic of massacring non-violent demonstrators failed to provoke any type of violent response from Palestinian resistance fighters, Israeli authorities escalated their economic siege of Gaza by completely sealing the Kerem Shalom commercial crossing, which was the only way that food and medical supplies had been able to enter Gaza apart from underground tunnels.